You can target 1 face-up "Inzektor" monster you control; equip this card from your hand to that target. While this card is equipped to a monster, that monster's original DEF becomes 2600. 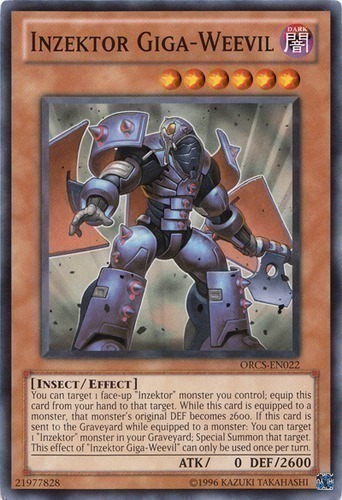 If this card is sent to the Graveyard while equipped to a monster: You can target 1 "Inzektor" monster in your Graveyard; Special Summon that target. This effect of "Inzektor Giga-Weevil" can only be used once per turn.